Rather than develop its own self-driving car, Microsoft has been playing to its strength in software by working with automotive companies on systems for turning the massive amounts of data from sensors into "actionable intelligence"
Microsoft's cloud computing platform will be used outside China for collaboration by members of a self-driving car alliance formed by Chinese internet search giant Baidu, the companies announced on Tuesday. The US software giant is one of more than 50 entities that have joined an Apollo alliance created by Baidu in April. Microsoft will enable alliance members to collaborate, share information and tap into the analytic power of Azure cloud computing, according to the companies. "Our goal with Apollo is to provide an open and powerful platform to the automotive industry to further the goal of autonomous vehicles," Baidu president Ya-Qin Zhang said in a release. 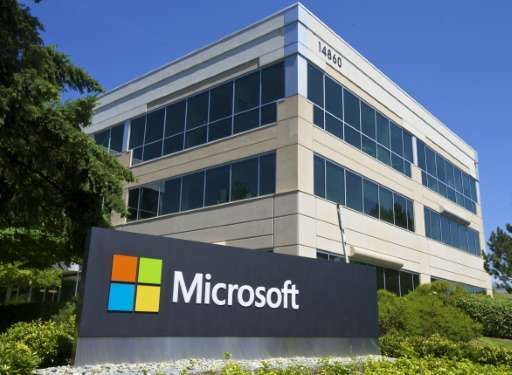 The companies did not say why the alliance would not use the Microsoft cloud computing platform inside China. However, Beijing tightly controls internet traffic in China and it was unlikely that Microsoft's platform would be permitted to operate unrestricted there. Rather than develop its own self-driving car, Microsoft has been playing to its strength in software by working with automotive companies on systems for turning the massive amounts of data from sensors into "actionable intelligence." Car makers such as BMW, Ford, Renault-Nissan, Toyota and Volvo use or have announced plans to adopt Microsoft's technology to help with services like driver assist, predictive maintenance and voice-controlled media, according to the US technology titan. "Today's vehicles already have an impressive level of sophistication when it comes to their ability to capture data," said Microsoft corporate vice president Kevin Dallas. "By applying our global cloud AI, machine learning, and deep neural network capabilities to that data, we can accelerate the work already being done to make autonomous vehicles safer." Most major automakers and several other technology firms have been stepping up efforts on autonomous driving in recent years, contending these systems will eliminate the vast majority of road accidents. Apple is the latest to have obtained a testing permit in California. US-based Tesla also is investing in self-driving car capabilities, as are firms in China and other parts of the world. US car rental giant Avis Budget announced last month that it will team up with Waymo, a subsidiary of Google parent Alphabet, on self-driving cars being tested on Arizona roads.